Mac OS X 10.7 Lion introduces a new feature in the Finder named AirDrop, designed for easy file sharing between nearby systems. However to use AirDrop, you'll need a Mac incorporating hardware support for the new feature, which involves Mac models built no earlier than late 2008. Earlier models can run Mac OS X Lion, but do not support AirDrop because they lack the WiFi hardware features to discover other machines. Apart from using AirDrop, these Macs will have to use Bluetooth file transfers or simply join the the same IP network (using Ethernet or WiFi) as the other systems they want to share files with, and use conventional file transfer protocols such as AFP, FTP, WebDAV, iChat file transfers or email attachments. As noted in an earlier article, AirDrop has nothing in common with DropBox, a cloud-based file sharing service more akin to iDisk. Instead, AirDrop allows users to discover nearby users and share files with them directly, without needing to configure a common WiFi network. For users who are already on the same network, it's long been possible to set up File Sharing, exchange account information and then perform file transfers. However, this involves some relatively complex technical understanding that many users find confusing, despite Apple's efforts to simplify things. The concept of infrastructure mode networking is similar to meeting people on Facebook, where everyone logs in and can exchange messages easily, even with new people. The problem with this kind of networking, however, is that it requires a sophisticated central entity managing the network, accounts, and all of your shared messages (the job FaceBook does). If you don't have an established network, you're now in the position of being at a party in a room full of strangers. You'll need to approach people and exchange pleasantries in person, something you won't need the infrastructure of a system like FaceBook to do. Of course, to do this, you'll need to all speak the same language, you might need an introduction, and others will have to want to talk to you. That type of "ad hoc" networking can already be done between systems using a protocol like Bluetooth, which can introduce two devices and support simple file transfers. Bluetooth is rather slow however, and involves a layer of security that involves a PIN exchange. WiFi is much faster, but users typically use it in "infrastructure" mode, which assumes that you have a central base station negotiating the network transaction for you (and, like Time Capsule, perhaps also providing a shared disk). Lion's new AirDrop makes basic file exchange between nearby users as simple as Bluetooth, as fast as WiFi, and as easy as drag and drop, with layers of security and personalization that combine with Apple's easily understandable user interface to make a conceptually complex task easy to initiate even for non technical users. There's already a couple emerging standards aiming to do what AirDrop does. The developers of Bluetooth (which functions like a wireless USB link) have released Bluetooth 4.0, which speeds up Bluetooth file transfers by initiating a connection over Bluetooth and then switching to WiFi to actually send the data. The developers behind WiFi (which is expressly designed to provide wireless networking rather than being intended to support wireless peripherals like Bluetooth) have codified WiFi Direct, a new protocol that allows a WiFi enabled device to act more like Bluetooth on the side: finding other devices, establishing a temporary secure link, and then supporting direct file transfers or printer connections, for example. 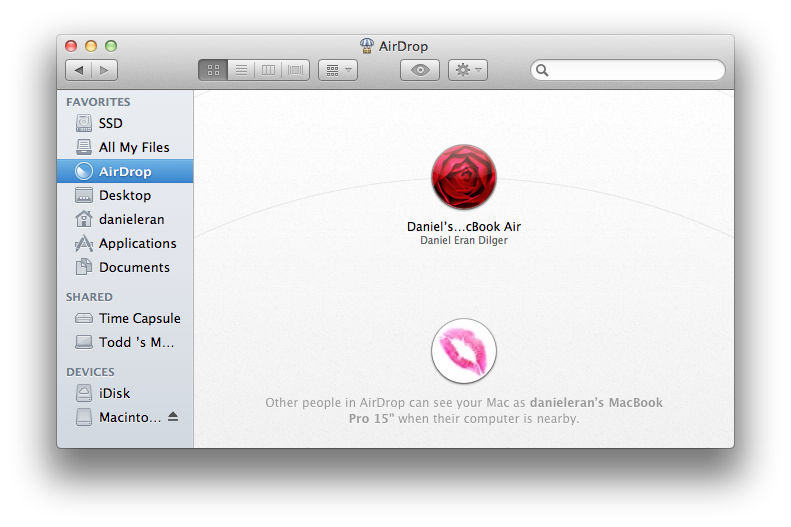 Apple's AirDrop isn't based on either protocol, but works similar to WiFi Direct. It allows Macs (and likely in the future, iOS devices) to discover nearby systems capable of AirDrop, negotiate a secure ad hoc connection via WiFi (even if both systems are already connected to different WiFi base stations), then presents a simple interface that depicts each discovered user, allowing for files to simply be dropped on an icon to begin a transfer. The receiving user only needs to accept the transfer. It's as simple as shaking hands with a stranger. Note that Apple's Bonjour technology (formerly called Rendezvous) does something different: it helps systems on the same local (infrastructure mode) network to advertise and discover available services (such as shared printers, iTunes or iPhoto libraries, or Apple File Server shares), without having to manually configure a centralized DNS to allow finding what's available. AirDrop works a bit like Bonjour without an existing network, enabling discovery of non-networked systems available and willing to set up a temporary connection. AirDrop's technology is currently used solely for file transfers in the Finder, but it is potentially useful for a variety of tasks (including printing or trading contacts), especially on mobile devices. It appears AirDrop acts like a Bonjour for SSID (WiFi network name) advertisements which other WiFi interfaces can browse and connect to, as opposed to the traditional Bonjour role of AppleTalk-like IP DNS advertisements on an established network. Rumor: AT&T employee blackout dates point to iPhone 5 release at end of Sept.